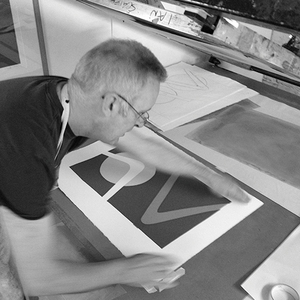 In my work, I am interested in exploring the interplay between shape and colour, and I find screenprinting suits my intentions as it allows flat, hard-edged areas along with a reasonably large print size in comparison to other print methods. My prints are made using paper stencils, which effectively means that the editions are very small - 10 to 15 prints is about maximum before the moisture in the ink begins to break the stencil down. The stencils are cut from newsprint using a scalpel; a process I enjoy and which which I think of as a means of drawing by cutting into the paper. Ideas for a print usually begin with making drawings, either in my sketchbook or on any scraps of paper that come to hand. I aim to find a combination of shapes or a means of combining areas of colour that I find engaging, and which allows further exploration of colour combinations and harmonies. I will often begin to think about the colour by writing on my sketches, then from there I use cut-out sheets of painted paper to arrange and finalise a composition, a process which can be quite short but which often takes several days. The writings of Johannes Itten and Josef Albers are influences on the way I think about colour and I admire the work of Ellsworth Kelly, Marc Vaux and graphic designer Jean Widmer amongst others. Educated at Goldsmiths College and Liverpool College of Art.